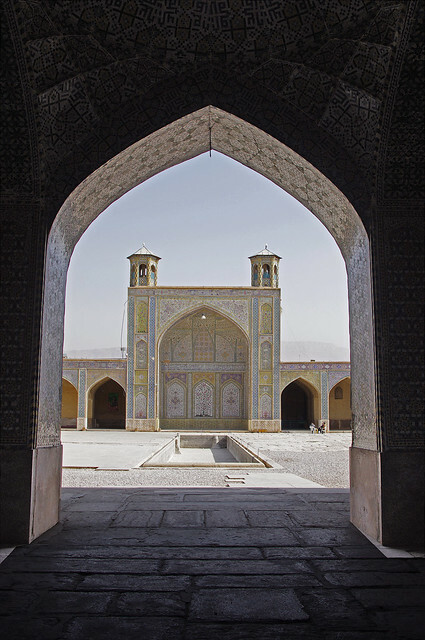 I couldn’t believe it – I was finally in Iran! (this was a line I would repeat for the next 9 days) And there was no better way to start my journey than in Shiraz – the city of wine and poetry. People may recognize the city name more for the type of wine, which was said to originate from this region in Iran. Today, however, the city is as dry as a bone. Liquor has been banned in the Islamic Republic since 1979 which is a shame, and their current assortment of non-alcoholic beers says nothing about the city’s recent past. Despite this, Shiraz looks like any modern, bustling city filled mostly with concrete. I arrived at my chosen hotel – Sasan Hotel – at about 6AM and showed by the kind innkeeper to my modest but spotless room (US$35 including breakfast). I practically just threw my huge backpack on the floor before going out. Stepping out of the hotel, this was when all the stares and “hellos” started. I suppose they don’t get to see East Asians that much over in these parts, although in theory, I was still in the same Asian continent. I went to the Arg-e-Karim-Khan just as the sun was rising. 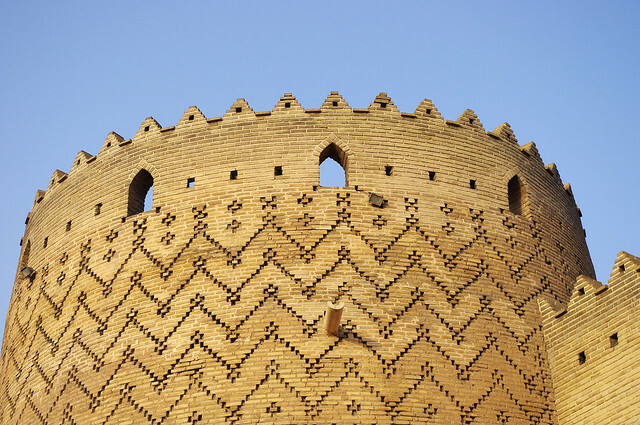 Shiraz is quite an interesting place – not just because of the exotic sounding name – but also due to this medieval looking structure located right smack in the modern city center. The citadel was built in the 18th century and served as the living quarters of the former rulers of Persia when Shiraz served as its capital. Today, this castle and some of the sites nearby are the last remnants of the era. A short walk from the Arg is the trademark Iranian maze-like bazaar which Shiraz is not exempt from having. But that was not where we were headed that morning. We were making our way to Nasir ol Molk or the Rose Mosque, famous for the stained-glass windows. It is best visited early in the morning to witness the sunlight shining through the multi-hued windows. It’s a photographer’s delight inside. 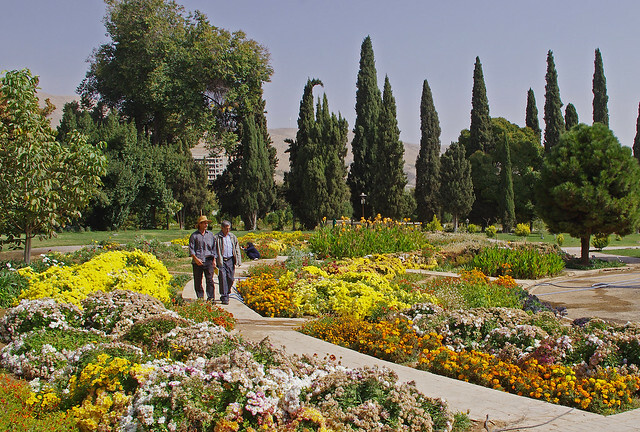 Shiraz is also famous for its gardens, and within the span of a day we visited three. These were the Naranjestan, Eram and Jahan-Nama Gardens. Out of these, I found Eram Gardens to be the most impressive. Out of the three, it is also only this particular one which UNESCO designated (along with about 9 other gardens in other cities) as among the World Heritage Sites. There were a lot of fashionable women around Eram, despite the mandatory headscarf. Actually, I found Iranians to be quite trendy in general, which surprised me at first. There seemed to be a national obsession with looking good, and many people in their 20’s have done at least a nosejob. I think this country can easily rival Brazil and South Korea in that department. For lunch, we stopped at this fast-food joint. And when I say fast-food in Iran, I mean kebabs! The owner was a very friendly chap and this was where I got my first taste of Iranian hospitality. In the end, he gave us a substantial discount for the meal – which was a befitting first meal in Iran. We ended up paying only about $4 per person for a chicken kebab, beef kebab, two orders of salad and drinks. What a steal. 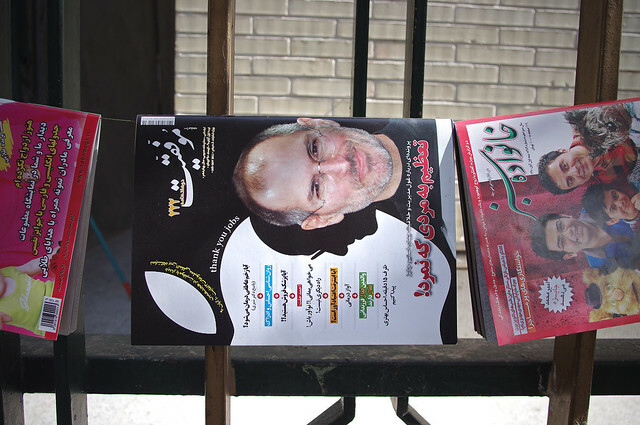 even in iran, steve jobs is well known! For the rest of the afternoon, we covered a few sights in the northeastern part of the city. This included the Ali Ebne Hamze shrine which had a bulbous dome and impressive sparkling glass panels inside. It’s not one of the most well-known attractions in the city, but I personally deem it as one of the highlights. We also made the obligatory stop at Hafez Mausoleum, a well-known Persian poet, and one whose works evoke a strong passion among Iranians. It is said that the people in this country would have at least two books – the first is the Koran while the second is a book of Hafez’s poetry. The place was quite atmospheric, with a loudspeaker blaring Hafez’s poems in Farsi. The actual mausoleum is in a small pavilion in the center of the grounds, with the trademark gardens surrounding it. We found sunset to be a great time to visit – this time due to the crowds. It was fascinating to see how many of the locals were entranced by this poet’s work, in a level which most people living in highly urbanized societies probably would never comprehend. Had a late dinner at Sharzeh Restaurant just off the bazaar, which turned out to be our most expensive dinner of the trip. The joint was touristy – after going to 7 sites earlier that day, this was the first place where I saw foreigners apart from us – but the food was quite good and had a live show. It was a fitting ending to our first day in Iran. 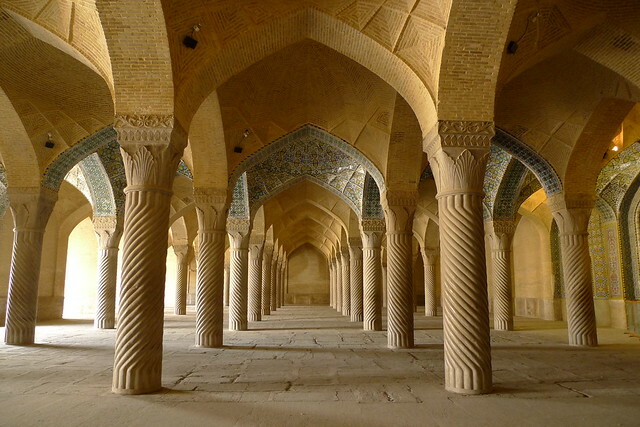 Most travelers, when looking back at their Iran trip, prefer Esfahan or Yazd over Shiraz. But after seeing what Shiraz had to offer and already being impressed by it, I began to hold higher expectations for the other cities that followed. Nasir ol Molk Mosque – come at 8AM when it opens! what a great post with beautiful photos, especially the stained glass one. thanks for sharing this! It’s enlightening to know the other side of Iran in the eyes of a traveller. My husband is from Iran and we would love to go some day! I am so glad you managed a trip and have the photos to share as it is very inspiring 🙂 So thanks! Hi Marina… Iran is a destination that I would really recommend, there’s a lot of things to see and do. Since your husband is Iranian, I’m sure he can speak more of Iran’s wonders than I.
well, he hasn’t been back in a while and many things have happened since then… n any case, thanks for sharing your trip! 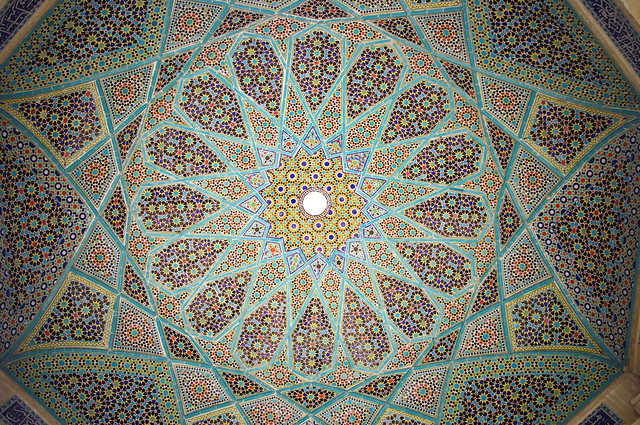 I liked Shiraz, it was pretty laidback compared to Tehran but not short of sights worth seeing such as this, the Vakil Mosque.